Triggerfish, in partnership with Sana is supporting the strategic move to digital commerce by bringing a B2C eCommerce experience to B2B organisations. Together, we're helping organisations reach their growth goals from business case to launch, and through beautiful, optimised, and user-friendly web stores. No more double handling, with a modern, mobile optimised web store that acts as your single source of truth and does the admin for you. B2B organisations can use their MarTech stack to help attract, nurture and retain customers too, with features like account-based pricing. 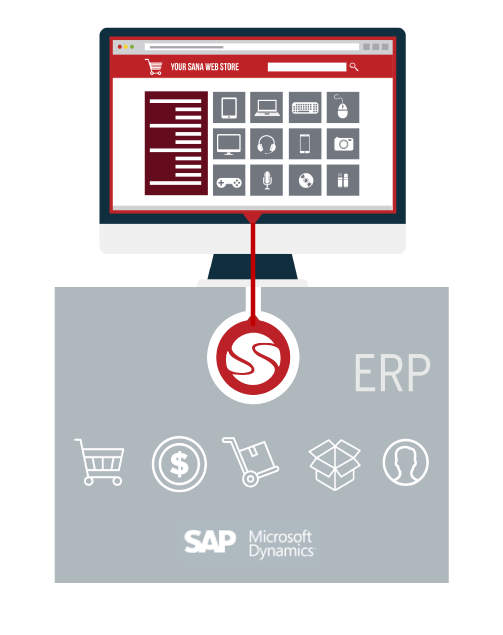 Seamlessly integrate with Microsoft Dynamics or SAP for a web store that’s a perfect extension of your existing commercial processes. Establish a marketing operations rhythm with ongoing campaign launches using our proven, growth-driven design process. Looking to Extend your ERP into eCommerce? Reducing dependencies on complex integrations and leveraging existing ERP investments can reduce time to market and help you grow smarter and faster. "We wanted something that wouldn’t have to be too hands-on in order to be able to achieve our goals. With Sana, building out the e-commerce platform was significantly easier than I thought it was going to be."